This post is sponsored by Home Depot and Procter & Gamble. We've needed a new dining table for several years now. Our old one was a bit worse for the wear. It's just been one of those things that I've put off in favor of other more pressing projects. Until now. This post is sponsored by Home Depot and Procter & Gamble as part of the Bounty Challenge. When I was asked to take part, I knew exactly what project I wanted to tackle. A new dining table! I have had this project pinned on my Pinterest "must makes" board for.ev.ah. It is from a plan drawn up by my good friend Ana White (perhaps you've heard of her). And since you can find the plans on her site - here's the link - I'm not going to rehash how we made the whole table. I will tell you that we made the table about 8" wider than the plans, and about a foot shorter in length, but other than that we followed the plans. And I will show you a bunch of photos! If you follow me on Instagram, you've seen a few teaser photos of this project. Like the day we went to Home Depot to pick up all of our supplies. We measured and cut down the wood, and then transported it up to my cute Papa's house because he has all the right kinds of tools for a project like this one. He basically built the table and then delivered it back to me to finish it up. I sanded that puppy until it was beautiful and smooth, and then we stained it with Minwax's Classic Gray. This is where the bounty came in handy, because boy can staining be messy! And you know what? It works really well for wiping away the excess stain. Check out the grain on that table top...soooo pretty! I decided to give the legs two coats of stain which made them more opaque, but I like the fact that they are a little darker - the overall effect is lovely! The entire project cost just $150! I'm so excited to have a brand-spankin'-new table in my dining room - the only problem is that now I've got ideas swirling in my head for an entire dining room makeover. Such is the life of a DIY-er/Designer/Blogger. Am I right? 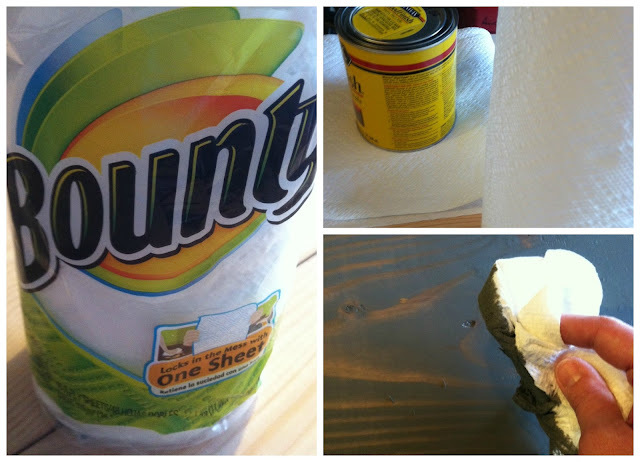 Today, the good folks at Home Depot and Procter & Gamble have offered to give one lucky reader of The Shabby Nest a $250 gift card to use on supplies for your own DIY project - and two rolls of Bounty paper towels so you can clean up after yourself. Lol! All you have to do to enter is leave a comment on this post! The giveaway will remain open until Tuesday, July 2 at 11:59 MST. Good luck! This post was sponsored by The Home Depot and Procter& Gamble but the opinions expressed in the post are 100% mine. I've wanted to make this very table! oh my gosh! i love your table! im moving into a new house next month, so I have a lot of DIY projects on my to do list! thanks for the chance! The table is beautiful!!! I love the grey color. Great job! fantastic!!! You can't tell it's a DIY because it looks sooo good! great job! The table came out great! What color stain did you use? It is so different. Love the dining room table, so chic while still very practical. Your table is gorgeous, rustic yet with an industrial edge! Oh my I'm in love with that table. 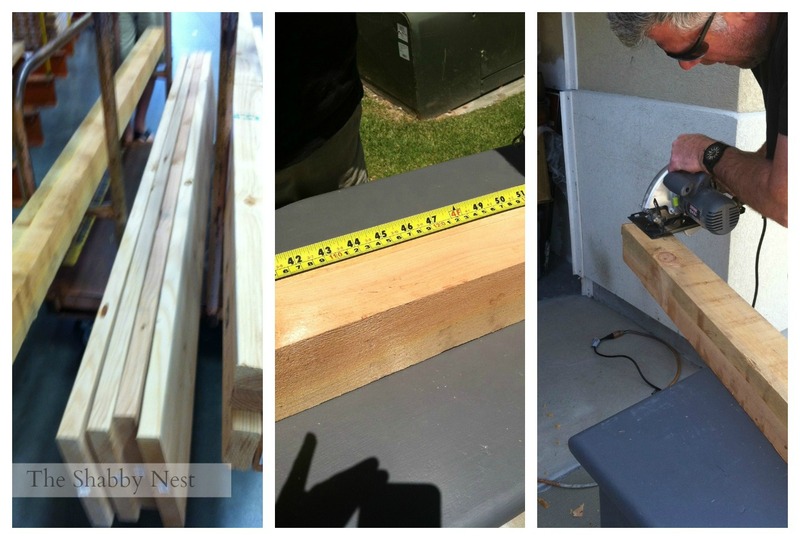 I have the perfect project with a little help from Home Depot. It looks amazing. Nice work! I'm also in the middle of 4,278 projects. I'm actually picking up a new warehouse light from HD tomorrow! Oh, what a fantastic table! My boyfriend and I have been wanting to build a coffee table for our living room. A gift card would be perfect for us! Love the design of your table and also the stain color that you picked. I love cleaning and these would really come in handy. I love the dark blue stain - very cute. Your table is fabulous!!!!! Please enter me for a chance to win. Maybe I can talk my husband into making a table for me to with it! That table is gorgeous! I really like the color of the stain. Oh gosh, I wish my dad would help me build a table. It's lovely! I don't think there is ever a day that doesn't have a Home Depot project list at least lurking in the background! $250 would help to finish the new playhouse we've been working on for the kids. so many projects - so little time! What a great motivator this would be though. That is a great looking table, very creative! Thanks for the giveaway. The table turned out just lovely! I'd love to use Bounty for lots and lots of messes around the house. The stain on that table came out beautifully! Love it! I love the way the table turned out. I appreciate this project since we were shopping for a kitchen table recently and they are not inexpensive for a quality table. I have so many projects that I could use this gift card for. Love the table! I have been wanting a new table and this is perfect!! We would love to build one!! I love the table! I have that on my to-do list. I need to refinish my table. Thanks for inspiration. The table is gorgeous!!! We are actually working on a dining room table of our own right now and know the amount of work it takes to get it looking just right! Good work! I'd be so happy to win the $250 so I can tackle something else on our DIY to-do list! Your table is lovely! Makes me want to get going on some of our DIY projects. I LOVE the table!! We just moved into a new home and have LOTS of DIY projects, and I am adding this table to the list for sure!! Thanks for sharing. Love the color combination. Gave me inspiration for cabinets that I need to redo! LOVE the table! I have about a million projects to complete at my house...I need to cure myself of procrastination! the table looks great! thank you for the giveaway! Love it! Thx for the giveaway... and I need to steal that horse print LOL! WOW! What a great table. I, too need a new dining table. I would love to replicate yours. Thanks for the chance! LOVE, LOVE, LOVE that table design and color! Must have one!!! What beautiful table. I love the how the texture shows on the table top. Just lovely. I would love to win a gift certificate!! Wow, this has turned out so great. Awesome work. I am moving Sept 1 so lots of projects going on in the moving process. That gift card would be so great for the new house! We're moving, too, so I'm saving every post that I think we might use in a new house! We could sure use that gift card! Love your table. Life is so fun when there are DIY projects to do, and I have several!! Love Ana White's plans. Your project turned out great! Great Table! Thanks for the giveaway! Your table turned out beautifully. Amazing job. Great job on the table. I have a wrought-iron and glass table outside that needs to be restored, it will look wonderful, once I get around to doing the work. I love the color of stain you used on the table, so chic! Fantastic Job. I want to start painting on my living room. I have tons of little projects I could start! Beautiful job! Love that stain! I need a narrow version of this table! Love it. Love your table! It's absolutely gorgeous! what a beautiful dining table, i love it! the stain you chose is so beautiful, i may have to try it on one of my upcoming pieces! LOVE IT!!!! Looks great in there! I'm trying to talk my hubby into making me a table like this. I love the big farmhouse style table! Your table reminds me of our very first dining room table that my husband made for us. The table was a huge upgrade from the TV trays that we had been eating on. Wishing you many years of good meals and good times around your table. This table would be great for outdoor picnics too. I love how easy it is to make! Refreshing my patio and would love to have some Home Depot and Bounty help! Thanks! The table looks awesome! We don't even have a dining room table currently, but for that cheap (and fairly doable--though I'm not much of a carpenter) this may be the next project! Love that color!! What a great table. Oh wow! What a generous give-away! I would absolutely be thrilled to win it. :) Have a great week! Newly single, and bought a cute little house - lots of projects! What a great prize! I have so many projects on my list...winning this would help me get them done! I love how the table turned out...especially the finish...that gray with the grain showing through is just perfect. I'd love to win the $250 ...I'd be down at Home Depot so fast getting supplies for one of my many projects. I'd love to win so I could blog about it! I need a bigger house! I love that table...and the color you chose. Great work. That table would look fabulous in my house. i love that table! 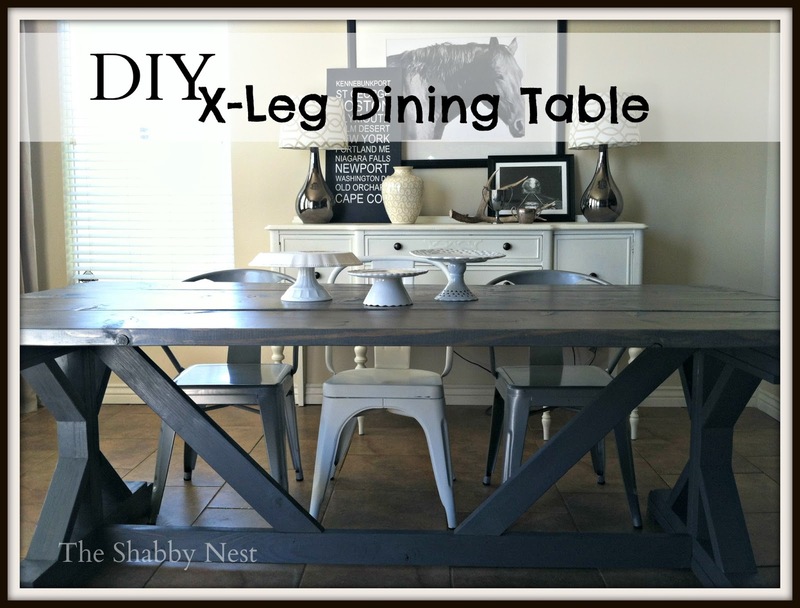 this was a great post, i love seeing new DIY house ideas! Love this! And the gray stain is perfect. My "to build" list is soooo long! This $$ would be fabulous to win & get me motivated to get to building!! Love your table and love the giveaway!!! Such a clever design. Ana really is amazing. And how fun to have it built by/with someone you love. Congrats on the new table. I can't wait to see what you have up your sleeve for Haven. Beautiful table - love the gray! Oh boy, what damage I could do with that gift card. Home Depot is my favorite place to shop (and that includes clothing and food stores)! I have a dresser I want to redo - this could be the start of something big! Love it! I bought a new table last year, maybe my daughter can make one for her new home. The table looks amazing!! Maybe one day I will become that ambitious. What a great farmhouse table! Great color. Good thing your dad must live close. Mine is in another city and I have so many ideas that involve sawing wood, I finally bought a table saw. Totally agree about the Bounty - every DIY seems to involve clean-up! Love the table!! And I just made it in under your deadline! Thanks, and Happy Fourth! It's gorgeous! I've wanted a new table for ages. I'm ready to chuck out our old counter height 4 seat table for something family friendly! Hi! Love the table and would love to make one, but the pictures on the actual construction are not clear. Any more pics to help out? Love the table, incredible room.